Trail riding develops the skills used in mounted search and rescue missions (MSAR). We aren’t the only ones who have noticed that active and regular trail riders have many of the necessary tools for searching for lost children and missing people. According to Irvin Lichtenstein, Chief of Operations for the Southeast Pennsylvania Search and Rescue unit, trail riders can put their knowledge and riding experience to work helping others. In terms of search and rescue, he points out that horses have excellent smell, hearing and see things humans often overlook. As a prey animal, people don’t typically develop the senses a flight animal uses. As such, a horse will notice smells and pay attention to sounds a person will miss. Horses are wonderful observers. 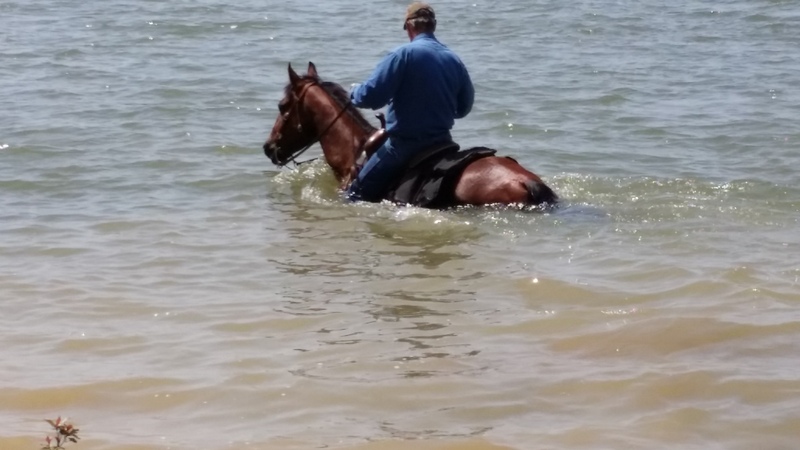 Mr. Lichtenstein gives a number of ways that you can make you and your horse ready to help a search and rescue effort. You start by riding the trails a lot, camping, trailering, and spending sufficient time on the back of your horse to get to know his reactions. He correctly brings up the need to trust your horse and for the horse to trust you. This relationship only develops with time together and experiences that create the bonds and mutual understanding needed for the work. We also appreciated his advice in taking trail rides fully packed for a search and rescue. It teaches your horse to be prepared and ready. The last thing you need when out to rescue someone is your own injury from an overly excited horse surprised by some new piece of equipment or the excitement he senses from you. The suggestion to practice riding the trail just like you were searching for a lost person makes sense. Trail riders be ready! You and your horse may be needed at any time and we know you will be able and ready to lend a hand! Trail ride is still set September 20, 2014 at Oologah Lake with everyone meeting at the trail head. We will be mounted and headed down the trail at 9:00am. 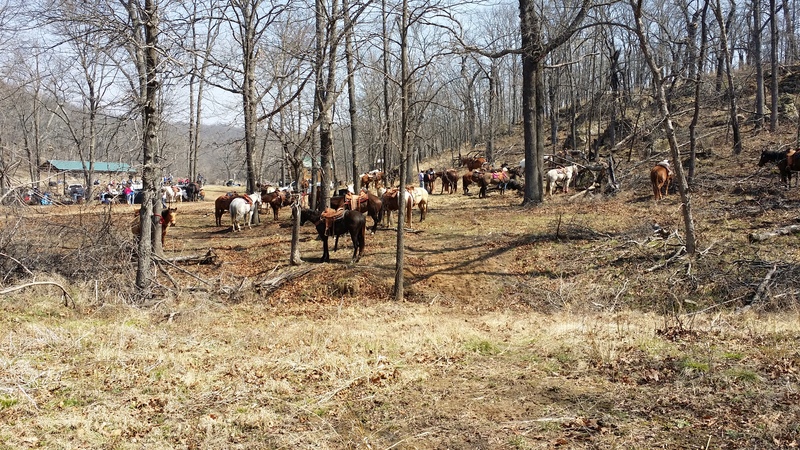 This trail ride is just a bunch of people getting together who want to ride and exchange horsemanship skills and enjoy a great day on the back of a horse. We plan to break about 11:30 or 12:00 noon for lunch. Be sure to pack yourself a lunch and take with you on the horse. We will plan to eat on the trail. It should be a relaxing day with several opportunities to watch how dressage fits into the usefulness of a trail horse. Trail riding is filled with all kinds of obstacles that make use of dressage techniques. It is also an opportunity for anyone interested in mounted search and rescue operations on horseback to talk with mounted patrol members about the skills needed to qualify both horse and rider. There has been a lot of interest expressed in the ride and we look forward to seeing everyone! The “Slick Trail Ride” , as many refer to the event, has been scheduled for October 11, 2014. The ride departs from. . . . yes that’s correct, Slick, Oklahoma promptly at 10:00am. The trail ride starts at the Slick Faith Baptist Church Arena and takes you through a beautiful private ranch. Registration starts at 8am Saturday morning, but the trail boss leads out at 10:00am sharp. If you have never been on an organized trail ride, this would be a good one to learn. These guys are old-time cowboys who are good with horses and with people. The ride is attended by a lot of experienced riders on quiet horses. It’s only a day ride with lunch served at noon which is really nice for the first time out. For those without a horse, there is a wagon you can enjoy, but it has limited seating. The $20 price is dirt cheap when you figure a really good lunch comes with the deal. Children under 8 attending with a paid rider can come without charge. It is a family style event with no alcohol allowed. Don’t forget your Coggins and look forward to seeing you there!! If you have any questions, you can call Mike 918-706-4230 or Dwight 918-724-2025, They will make you feel right at home and most welcome! The Bad Girls have announced their Just For Fun trail ride September 20, 2014. We were sorry to hear it was scheduled this date as we like to ride with them. But, we already committed to be at Oologah Lake the same day and don’t want to disappoint anyone. Even so, if you are looking for an organized trail ride on September 20th, you might give it a try. Our day ride is not organized and just for whoever decides to be there. The Bad Girls are always well-organized and usually put on a potluck lunch or dinner. The Just For Fun ride will be at Bell Cow Lake just outside of Chandler, Oklahoma. There is a modest charge for the event. For more details, you can call Susie at 918-430-6441 or go to the Bad Girls website, newly designed and looks great ladies. Just for the record, the next time you are going to set up a trail ride, do it on a date we don’t already have plans. Hope you have a great time!!!! The 2014 Labor Day Trail Ride sponsored by OETRA is just a few days away. In Oklahoma, trail riders are ready to hit the trails by Labor Day weekend as August is usually hot and dry. Due to the heat, there are not a lot of trail rides in Oklahoma in August. Early September brings some cooler temperatures and wonderful trail riding weather! The ride is open to members and non-members and will be held at Robbers Cave State Park. The cost is $10 per person for members and $15 per person for non-members with family maximums for all. We plan to attend part of the weekend, but can’t make the entire event. Hope to see you there! For more information, contact Wendy Hanson, imacowgirlforgod@gmail.com, Dawna Graham, dawna.graham@att.net or the web page for this outstanding Oklahoma trail riding association. The Woolaroc Fall trail ride has been set for September 13, 2014. The Woolaroc Ranch is beautiful place established by Oklahoma oilman, Frank Phillips. An avid rider who enjoyed being on the back of a horse, Phillips created a foundation to operate the ranch for decades following his death. Woolaroc is nestled in the rolling hills of Oklahoma’s Green Country and gives trail riders the opportunity to bring their horse to ride across the ranch twice a year. The ride is approximately 15 miles long and divided into a morning and afternoon ride with lunch provided. They make a tasty buffalo barbeque sandwich that really hits the spot when you finish the first half of the day. Fall in Oklahoma is a great time to ride. The temperature will usually be lower than our traditionally scorching Summer. The Woolaroc ride will be a great time for anyone interested. For more information, you can contact Woolaroc Ranch 918-336-0307 ext. 10. 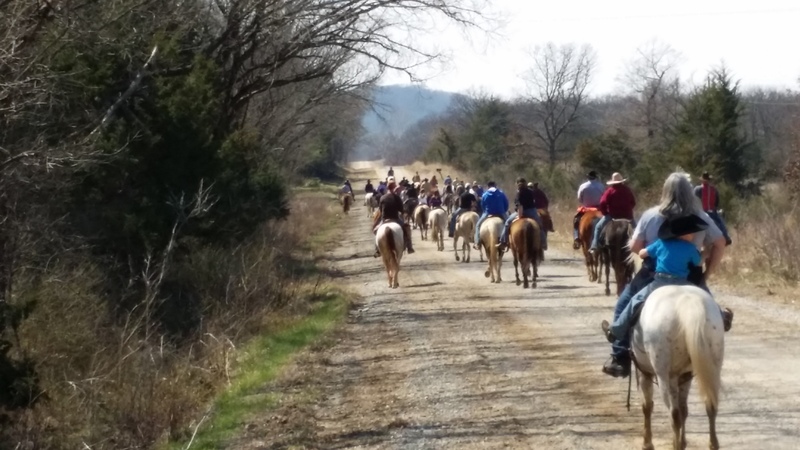 The lunch break at the CCC trail ride in Slick, Oklahoma was filled with laughter, horse talk, and gospel music. The Coalition of Christian Cowboys offered more than just great company and superb food, they pulled out their instruments and played for everyone. The cowboys are the real deal! They can sit a horse and play a tune. Most of all, the make you feel right at home! Coalition of Christian Cowboys Trail Ride Was A Huge Success! The trail ride in Slick, Oklahoma that the Coalition of Christian Cowboys put on Saturday was fabulous! You could not ask for a better time. The hosts, members of the Coalition of Christian Cowboys, were some of the nicest folks you could ever meet. Kind and courteous with the old style cowboy politeness of days long past set the tone for great day. The weather was splendid with the morning cool enough for a jacket and warm enough to want to take it off once lunch was over. The meal at lunch was perfect trail ride fare with barbecue sandwiches, hot dogs, fresh hot cobbler from a dutch oven, and wagon loads of cookies. The trail ride was managed extremely well by the cowboys of the group making sure no one got lost and the ride proceeded safely. At home on a horse with years of experience as working cowboys, the team kept everyone moving along on time and helping any of those who needed it. Many of the attendees were experienced riders mounted on sound, well-behaved horses. It’s hard to articulate the difference in a well-run trail ride with competent riders from the ones that lack these key elements unless you’ve been there, and done it. Trail boss, Dwight Plant, talked with us for a bit after returning to the trailers and explained the Fall ride will take place in October. We already plan to attend and suggest you do the same. This is a really great bunch of people who run a really nice day ride. We’ll tell you a little more about the ride and the CCC a little later. Sum it all up, a great day with wonderful people, lots of sunshine, warm weather, and experienced horsemen! The 19th annual City Slickers Trail Ride sponsored by the The Bad Girls Trail Riding Club is scheduled for June 7, 2014. The ride will be held at Walnut Creek State Park, Prue, Oklahoma. A family event with camping overnight in the Spring and trail riding near Lake Keystone is an event to write on your calendar. These ladies will undoubtedly make this trail ride and the entire weekend a whole lot of fun. For more information, you can contact Carla Hight by e-mail at cmhight1@peoplepc.com.